Aerialand was founded by a group of talented professional artists coming together from different backgrounds, motivated by the intent of teaching at the highest level. Each artist brings their own unique approach to create incredible choreographies to support the artistic development of aerial and acrobatic performances. 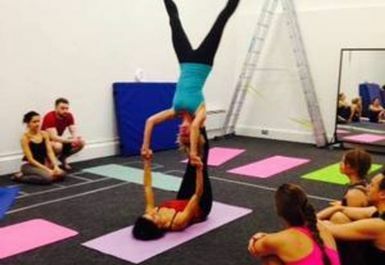 Aerial classes are a great way to get fit fast whilst having fun! Training on aerial equipment works pretty much every muscle in the body. Your arms - wrists, forearms, biceps, triceps and shoulders will all get a workout. Legs, quads, abductors, calves, ankles will all be hard at it. It is also an amazing workout for your back and your abdominals and it strengthens your core as you work. 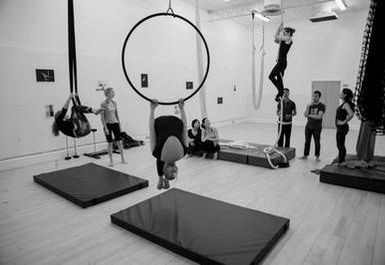 You don't need any experience to be able to give aerial classes a go as they focus on good technique, conditioning and elements of performance with the equipment. Whether you are an absolute beginner looking for a great way to get active whilst having fun and learning something extraordinary at the same time, or you are a professional artist wanting to enhance your skills and looking for an easily accessible space to train and develop your routine, this is the place for you! Aerialand can be found on Galena Road near Ravenscourt Park, West London. There are plenty of public transport options available with Ravenscourt Park (District and Circle) tube station just a few minutes away. You can get a number of buses to the studio with 27 (Chalk Farm - Chiswick Business Park), 190 (Richmond Bus Station - West Brompton Station), 266 (Brent Cross Shopping Centre - Hammersmith Bus Station) and many more stopping at the end of Galena Road.